Before we go practical, we need to discuss some theoretical aspects. Choosing the G-Buffer format is one of the most crucial steps in deferred shading. You have to make a compromise between quality and speed. Greater quality comes from greater precision or larger number of parameters. These two determine how large the G-Buffer needs to be, which can affect the performance. We saw earlier that the G-Buffer needs to store a whole lot of information. Normally, the result of rendering is a single image, but we need several: one for each component of the G-Buffer. One way to achieve this is to render the scene in multiple passes, each time with a different shader, and to a different RenderTarget. This means that the computations on the scene geometry will be done several times, and lots of Draw calls will be made. Multiple Render Targets (MRTs) allow the pixel shader to output several colors at once. This is exactly what we need, since the scene will be drawn only once, but all attributes will be generated. When using MRT, we have some restrictions. First, all RenderTargets have to have the same bit-depth. This means you cannot have a RenderTarget which is of SurfaceFormat.Color (32bit RGBA), and another that is SurfaceFormat.HalfVector4(64bit R16G16B16A16F). This poses some new restrictions on how we setup our G-Buffer. If we use large formats (64 bits), we will have good precision where we need it (normals, positions, depth), but we will have wasted space in other places (color, specular intensity, etc). On the other side, if we use a smaller formats (32 bits), we will have better performance, but lower precision. Next we’ll analyze the design choices for each G-Buffer component. The main components that need to be addressed are: diffuse color, normals, position . After these are fixed, we can focus on adding material attributes, such as specular intensity or specular power. Ok, this one is simple. We need to use SurfaceFormat.Color, which is on 32 bits. However, if the rest of the attributes would be better suited by 64 bit render targets, then we can also make the diffuse component on SurfaceFormat.HalfVector4 . The second option wastes some space, but some configurations may be ok with this. SurfaceFormat.Color – This gives 8 bits for each normal component X,Y and Z, and also, we are left with a free 8-bit field (from the alpha channel), which we can use for other parameters. If we choose to use this format, we’ll have to take care when storing / reading normals. SurfaceFormat.Color can only store values between 0.0f and 1.0f, but the normals can be between -1.0f and 1.0f. This is easily solved by converting the [-1.0,1.0] domain to [0.0,1.0] domain before writing the data, and converting back when reading the data. SurfaceFormat.HalfVector2 – This format gives two 16-bit components. But wait, you might say, the normal needs 3 components, since it is a vector in space. Indeed, this is true, but since we always want the normal to be normalized, and since the X,Y and Z axis are perpendicular to each other, we can only store X and Y, and then compute Z with the formula Z = sqrt( 1 – X*X – Y*Y ). By using this, we have both high precision normals, and 32 bit RenderTargets. SurfaceFormat.Rgba1010102 – Shawn Hargreaves suggests this in his paper. This is a nice version, on 32 bits, with good precision, and also leaves us a 2-bit channel if we want to use it. However, I tried creating a RenderTarget of this format on 3 computers, and it didn’t work. SurfaceFormat.Vector4 – this is a 128-bit format. Again, this forces 128 bit on the other RenderTargets, which wastes very much memory, and is not available on the Xbox. SurfaceFormat.HalfVector4 – 64 bit format. This has good precision, and also leaves us with another channel were we can store an extra attribute. SurfaceFormat.Single – this is the third option, and the only option if you want to have 32-bit wide RenderTargets. In order to use this, you only store the depth of the pixel, instead of the whole position. When we need to use the position, we have the screen-space X,Y position of the pixel, which, together with the depth can be used to compute the world position corresponding to that pixel. When we reach this point, we might already have some free channels remaining for extra attributes. If these are not enough, we can add a new RenderTarget dedicated strictly to extra attributes. Choices for this extra RenderTarget can be SurfaceFormat.Color, when using 32 bit targets, or SurfaceFormat.HalfVector4 when using 64 bit targets. For the rest of this article, we will use to following setup for the G-Buffer, with three 32-bit Render Targets. For now, we will use a simple lighting model (Phong), in which the light is composed of the diffuse light, and specular highlights. For this, we only need as extra parameters information related to specular lighting, which is Specular Intensity and Specular Power. The 32-bit depth value is used to compute the position of the pixel in world space. The precision of the normals is not that good, and this might be noticeable for some surfaces. The advantage is that this setup is very compact, and the performance is very good. We need to add some variables in the DeferredRenderer class. These are the three RenderTargets we will use: colorRT, normalRT and depthRT. We then initialize them in the LoadContent function. Next, we will create two functions called SetGBuffer and ResolveGBuffer, that set the render targets on the device. We set the colorRT as the first render target, normalRT as the second, and finally, depthRT as the third. //set all rendertargets to null. In XNA 2.0, switching a rendertarget causes the resolving of the previous rendertarget. Before we draw anything, we need to clear the G-Buffer to default values. The problem here is that we can’t simply use GraphicsDevice.Clear(), because that would set all render targets to the same color, which is not something we want. We need to clear the color render target to Black, the depth render target to White (which means maximum depth), and the normal render target to Grey, which, when transformed from the [0,1] domain to [-1,1] domanin, will become (0,0,0), which is a good value for a default normal. This will prevent lighting artifacts from appearing on the background, where no other object was drawn. To fix the clearing problem, we will need to create a new effect file, named ClearGBuffer.fx, inside the Content Project. Inside this effect, we set the render targets to the values we want. In the vertex shader, we just pass the position further. We will use the quadRenderer to draw a full-screen quad. We will load this effect file into a variable, and then we will create a function called ClearGBuffer() in the DeferredRenderer class, where we draw a full-screen quad using this effect. Finally, in the Draw function, we set the G-Buffer, clear it, draw the scene, and then resolve the G-Buffer. If you run the game now, you won’t see anything. (Actually, you’ll probably see a violet screen, because of how RenderTarget switching is handled in XNA 2.0). This is normal, because we didn’t actually draw anything. Next, we will add some items in the Scene class, and draw them using a special shader. We will now create an effect that will be used to draw all geometry in the game. 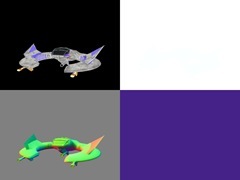 This effect will output values to all render targets, and it is responsible for filling the G-Buffer, so it is one of the main pieces of code for the deferred renderer. To create a new shader, right click the Content Project, and Add New Item, select a new Effect File, and name it RenderGBuffer.fx. After this, we get a template for an effect file. We’ll make some modifications to this. We need to add a texture, and a sampler for it. This will be used to draw the color of the model. For the specular intensity and specular power, we will use two effect parameters, for now. In a later chapter, we will see how to read this data from textures. For specularPower, we will store a value in [0,1] range; which will be multiplied later by 255 to obtain a power coefficient between 0 and 255. Because we will be outputting normals and depth, we need to add the normals to the VertexInput structures, and normals and depth to the VertexOutput structure. We also need texture coordinates. The depth is a two-component vector, because we will only do the division by w in the pixel shader. Otherwise, strange values are obtained when the vertices of a triangle are out of the view frustum, but the triangle is still visible. The VertexShaderFunction remains mostly the same, for now. We only need to add three instructions for the new outputs. The normals are transformed in world coordinates, and the depth is composed by output.Position.z and output.Position.w. We are now left with the Pixel Shader. Since we are no longer outputting to only one render target, we need to have an output structure for the pixel shader. This will contain three float4’s, each one for the corresponding render target. Now that we’re done with the effect, we’ll add some code inside the Scene class. For now, we will just add a model, its texture, and draw them using our effect. This code will change a lot later, when we will see how to integrate normal mapping and specular textures using the content pipeline. But you don’t have to worry about that now. Now, before moving on, let’s try and see our G-Buffer. For this, we will need a SpriteBatch in our DeferredRenderer class, and we’ll draw the three render targets at the end of out Draw code. Now, we should see the contest of the G-Buffer. The depth might seem all-white, but it isn’t actually: the values are close to white because of how depth precision is distributed in the scene. Hi there, very nice tutorial and easy tutorial. I have Geforce fx 5500 which supports only 1 render target 🙁 , but I’m trying to convert your code to work on 1 render target instead of 3. So can this process be done ? ( I don’t consider performance, I just want to make it work on my card ). You still create 3 render targets, but instead of drawing to them all at once, you have to make three passes, each time using a different render target and a different shader. If you have any problems with doing this, please let me know, and I’ll help you. The link is fixed, but looks like updating messed up my code. Oh sorry, yes, your method is correct. You would still have to modify each effect used by models in your game to write to the second render target. nice article however when I try this my Depth target always comes our green and white, my Normals look washed out and the background is black, and the Diffuse looks exactly like yours. I don’t know why you would be getting green in the depth buffer. Ok well I may have fixed most of my problems. The only one that still remains is the depth buffer color is still a greenish blue color. It seems to have to do with the “SurfaceFormat.Single” if I set it to color it works perfect? the shader code also does not seem to respond to colors. example if I output a color in the clearBuffer effect it remains a certain the greenish blue the difference is instead of the gradient it is solid. I also have the problem that if I change the Color.alpha or the Normal.Alpha it breaks the the other to color slots making the background stay the purple color. I hope this makes since its kinda late. Wait, you mean you get CYAN (http://ro.wikipedia.org/wiki/Cyan) ? That’s natural. Because in floating point textures, you alter the red channel, and if the red channel varies from 0 to 1, and green and blue stay at 1, then you have different shades of Cyan, so that’s ok. Thanks for the notification. Normally there’s no difference on that front between 2.0 and 3.1, so I don’t know why that was needed. I’ll be coming back to do more samples and tutorial, but probably only in July/August. Correct packing code would convert the normal to spherical coordinates. and the game need 4 MRT , so i can’t do anything to play that game ? No, if your video card only support 1 render target, you can’t run this example. You could theoretically do something similar with nu support for MRT, that is, to draw each pass of the Geometry Buffer one after the other, in a different render target, but would thus loose all benefits of MRTs, and using Deferred Rendering this way wouldn’t make much sense. or any AGP cards better than these ? If you can find an GeForce 7600GT or greater running on AGP, than you’re set. Of course, a PCI-Express card would be better, but I assume your computer doesn’t have a PCI-Express slot. my friend told me ATI Radeon still release AGP products until now,even this is PCI-E era. Radeon 3850 AGP vs Geforce 7600 ==> winner is 3850 ? or you could not obtain the image you put as result. Hi, I just bumped into this the other day and tried (still trying) to put some of the code to use in my bsc thesis, using XNA 3.0. ATM the only minor problem I’ve got is that when I draw the resolved rendertarget textures with the spritebatch, the first draws OK, but the other two appear as completely transparent/cyan, depending on the surface format. And this seems SpriteSortMode-dependent. With BackToFront I get the last one (the depth rt) correct, with FronToBack or Deferred only the first appears right. Strangely enough (for me), RenderTargetUsage.PreserveContents seems to solve this problem even tough I’m pretty sure the rendertarget textures shouldn’t lose their content because of a mere spritebatch draw call after being resolved. It might not be worth the pondering, but I’m still curious what I’m missing. I want to say thank You for great article and piece of great code. Now after ziggyware.com I left with code only:). I will appreciate some help. I’m using geoclipmapped terrain made in GPU. It is built from heightmap. It is easy to get normal map from heightmap with many programs. But I don’t know how to build in Vertex Shader TBN Matrix. Do you know how to get binormal and tangent from normal map or heightmap? Do you have maybe VTF terrain merged with deferred lightning HLSL code or documents, links where I can find solution how to do it? This is a great tutorial however for people reading this should also read the ShaderX2 article on deferred lighting with multiple render targets, it will definitely fill in some gaps and explain the process a bit more thoroughly. Thanks for the awesome tutorial! I managed to make a simple rendering engine, but I’m having trouble getting the depth value out of the depth render target. How do I get the depth in XNA units from the [0,1] values? but I can’t figure out what I’m supposed to multiply with/divide by. I’m currently using XNA 4.0 and I’ve been able to convert everything in this chapter over to it so far, but I’m have a problem with there being no depth buffer (I think) for the textures. So I render the ship, but I can see things that should be behind pixels being rendered in front. We have this depth buffer we can use, but how can I set it up to make sure there isn’t a problem with the depth buffers for the render targets? Thanks for the help and the excellent tutorials. IN HiProfile in XNA 4.0 we can’t use SurfaceFormat.Single with AlphaBlending for depth texture. Any sugestions how to fix this problem with depth buffer format? I’m trying to convert your code to XNA4.0, by slowly following each tutorial. Now I’m a bit stuck on the point light, directional light works perfectly, however the point light doesn’t lit any thing. It seems that at least attenuation is not correctly computed (always 0). But it also seems that even when removing this from the equation things aren’t exactly lit. When I return a solid color in the shader I get to see the moving sphere. But somehow something is wrong :P.
If you have the time could you give me some pointers on what I could check that is causing this? If you are extremely bored, maybe even to glance at the code? You can contact me for further questions @roytries on your twitters, and I think you have my e-mail address. Sorry for bothering you like this. I’m really stuck. And ofc I’ll share the code with you once I’ve completed the tutorial and cleaned up the code :). Computing normal from X and Y as mention here have subtle incorrectness to them, as the Z value will can go either positive or negative after perspective projection. This method simply does not account for it. To get real Z value from only X,Y value is usually too much work (is possible but is computationally heavy), most in the industry just simply store the X,Y,Z in the Gbuffer as is.